Entries reveal calls to family members — and orders for executions. Heinrich Himmler, head of Nazi Germany's SS and one of the architects of the Holocaust, seen in an undated file photo. Dinner parties... phone calls with his daughter... massage sessions... and orders for mass murder. Newly uncovered diary pages show in chilling detail how Heinrich Himmler, head of the SS in Nazi Germany, plotted some of the worst atrocities ever committed while also finding time for his family. 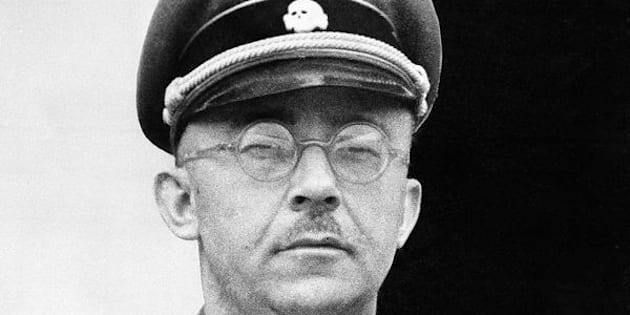 Although many of Himmler’s diary pages were previously discovered, some 1,000 pages missing for more than 70 years were recently found in an archive in Moscow where they were listed only as “diary,” according to the Jewish Chronicle. The diaries are being published by Germany’s Bild newspaper, with many of the details translated in the British press. In one entry, reported by The Sun, Himmler referred to a “comradely” lunch at the Dachau concentration camp, scene of 41,500 murders. In another, he “took a snack in the cafe at the SS casino” at Buchenwald, where 56,000 were killed. The paper reported that Himmler often began his days with two-hour massage sessions, and called home to speak with his wife, Margarete, and daughter, Gudrun “Puppi” Burwitz nearly every day. That daughter, now 86, has remained involved in neo-Nazi causes. Heinrich Himmler, third from left, greets Nazi leader Adolf Hitler in 1944. “The most interesting thing for me is this combination of doting father and cold-blooded killer,” Damian Imoehl, the journalist who helped to track down the diaries for Bild, told the Times of London. Some of the greatest atrocities of World War II were given only passing reference in the diary’s pages. “Tour of SS-Sonderkommando” was how Himmler listed a trip to see diesel engines being used to gas prisoners to death at the Sobibor death camp, according to The Sun. Because there were no Jewish prisoners available to kill, 400 Jewish women and girls were rounded up from the nearby city of Lublin and murdered in the gas chamber. After the mass killing, Himmler had a “banquet” with SS officers. Heinrich Himmler, left, inspects a Nazi POW camp in the Soviet Union. Himmler was stripped of power and arrested in April 1945 after he was caught trying to negotiate a deal with the Allies. He escaped, but was caught by the British. While in custody, Himmler killed himself with cyanide on May 23, 1945.